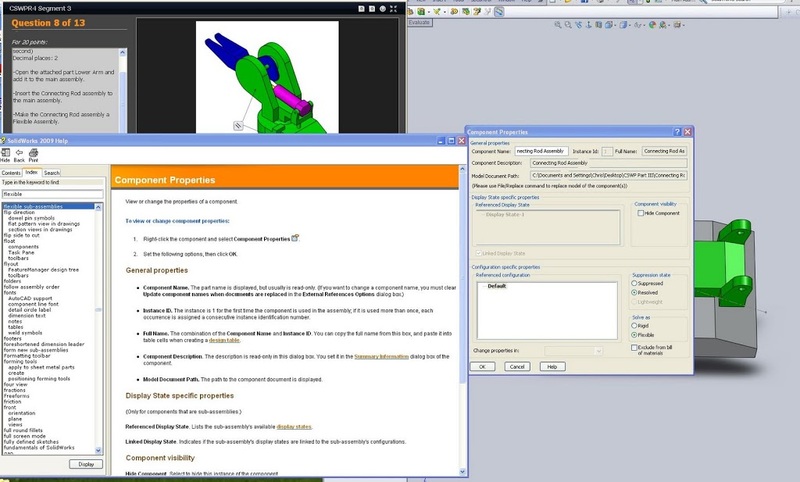 Prepare for SOLIDWORKS certification with online training, sample exams, & tutorials available 24/7. The last portion of the CSWP shows that a user is capable of working with more than a single component. This section focuses mainly on assemblies, adding components, positioning them and replacing them. Again for most users of Solidworks this is a day to day occurrence. Mold and tooling folks use these features to build up large assemblies, mechanical engineers build machines, and even modelers do this as a real life way of breaking things down. It’s important that any user tasked with adding and placing a piece, such as a fastener, be able to locate it so that rebuilds will be quick and easy and aviod wasting time reselecting mating faces. So how is this section laid out? That’s the screen the testing agent gives you, although the 13 is misleading. It’s really only 12 questions as question 1 is simply instructions. The test begins with a quick modeling exercise. A few drawing views are given and a part must be created. This component was fairly basic as the feature tree was a whopping 8 features for me. Grab the mass of the component and that’s question one down. Next you are asked to add a series of components and position them as needed. Special care should be taken to get each mate right and more so the coordinate system. Most question ask for a Center of Gravity (Center of Mass) in relation to a specific coordinate system. To get this it may be helpful to take a look at Setting a Coordinate System in Solidworks. Really that takes up the next chunk of questions. Add a part, add some mates, grab a mass. The mates used were mostly basic with some need for advanced mates such as “width” but again any user adept at building small assemblies should have no problems with this. One thing that did pop up I was unfamiliar with was the flexible assembly. This is used for sub assemblies, rather than being able to move each component individually the default is to import the sub assembly as a fixed feature that moves as a one. Luckily I’ve had experience answering lots of random questions for people and realized the help menus would tell me what to do. Even mid test THE HELP MENU HELPS! It’s part of the program so even while testing I see no issues with refering there. Here’s a shot of the question next to a help file letting me know what to do. For the final few questions another part must be created from scratch but again if you have passed the first 2 sections this should be a breeze. Lastly a part needed to be replaced. A new file is provided for download. Quickly select the old component in the feature tree, right click and select replace component and that’s about it. Then simply reselect the required mating faces and voila, the CSWP is done. Best of luck on the test. Get more help now with SOLIDWORKS certification with online training. I am on the third part now. Can u help me. I run SW2008 with 1 GB RAM and 2.8 Intel processor and when i try to make a bigger assembly (more than 7 parts) it sometimes crushes. It crashes also with the design table. It hapeneds on my CSWP segment 2 but i managed to take it. This also hapeneds on my CSWA exam when i tryed to mirror some faces instead of just mirror features, but there was a plenty of time. So if u can send me a sample file from your exam i will appreciate it. I won’t be posting any of the sample files form the test, I think this takes the help a bit too far given t hat at times the models won’t change (just values). I’d call your VAR or check with Solidworks. Failing of such a small assembly would lead me to believe you have some hardware or installation issues that need to be addressed. Also a VAR can sometimes give you access to one of their seats for the purpose of taking the exam. No there was no problem. I just wanted to check if the problem occurres with a large assembly so i made one before the test and everything was OK.
And Yes. You are wright. The assembly was the same so it is not fair to share the files. I would not do it too. I failed. I have made a wrong angle mate which spoils my last 4 answers and i only got 100 scores. It’s not a big deal since i’ve passed the first segment. I will pass this one after a month. Now i know what can i expect and i feel prepared. Time was not a problem. I just learned about collision detection before the test. And your hint about flexible sub-assembly was also very useful. Thanks! I am a new grad engineer and I am self-learning SW from 5 months and i enjoy it very much. I think it is a good result so far. I recently failed CSWP Part II and now the tester won’t let me write part II – any suggestions? I believe you need to wait 14 days before retaking any portion of the exam. I goofed up the second part in section 2 this past weekend, passed section 1 and will take section three shortly. This section was very easy for me. Section two was a little tougher though. Thanks for the write-ups on these, it really made me feel at ease knowing what to expect. 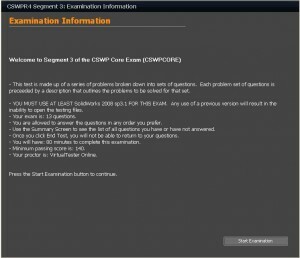 SW should set up a practice exam using the virtual tester so you can get used to that first. 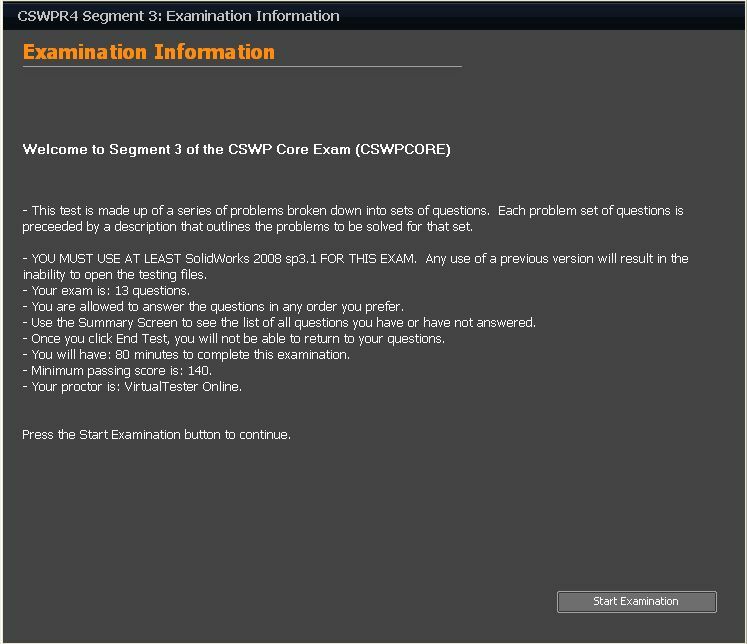 I guess now I need to complete 3 more CSWP exams and then go for the CSWE! Will you be posting any info on the CSWE? Thanks, glad it has helped. There are obviously a few posts about other exams but the CSWE is different in that the certification people at SW are adamant about not seeing details about it on the web. The test is more robust and is a fun assessment of skills, best of luck if/when you get to it. what about configurations in assemblies, have you faced any related questions? also what about linking equations between parts in the assembly is there any?? So there was nothing on Collision Detection? Linked equations are up to you, or use equations. Both will help but it’s not necessarily required. As far as collision detection it may be in the rotation of questions but wasn’t on my exam. I would suggest you learn how collision detection works and be able to measure angles and distances at point of collision, or grab a COM. does the CSWP Sheet Metal test be different structures and cover 3 parts? I’m having trouble with segment 3 orientation. When I apply the distance mates and angle constraints, the model in the exam is not in the same orientation as the one I have created. Can someone please help me with this ASAP. I recently took segment 3 and followed every step to a T. I absolutely know for a fact that nothing was wrong but I was still show 3 wrong answers by the end and I failed. Anyone else have this happen?